The best reward for doing a social marketing campaign is seeing behaviour change in response. 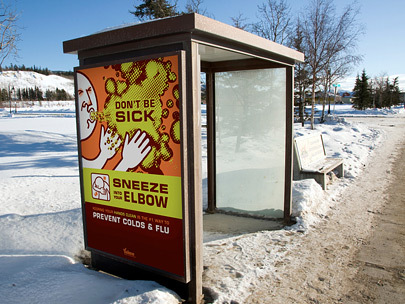 After launching our "Don't be sick” campaign, we were thrilled every time we saw a Yukoner sneeze into their elbow. 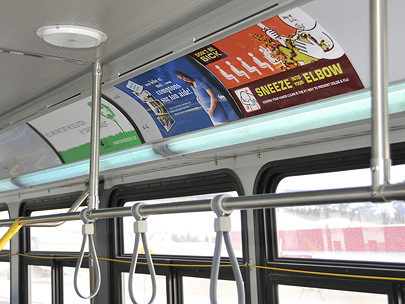 Equally thrilling and fantastic is winning the Design Edge Regional Design Awards for the same campaign in two categories: advertising design – print, and advertising design – outdoor. Remember last winter living with the threat of H1N1 and the unending variety of colds and flus? Working with our client, Health and Social Services, we developed a practical and non-threatening strategy to encourage Yukoners to take action to protect themselves. 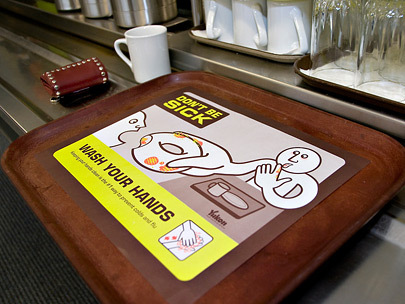 Our concept consisted of pairing a simple directive (Don't be sick) with a sickly but lovable character who communicated what not to do during cold and flu season, while consistently presenting 3 simple steps (wash your hands, sneeze into your elbow, clean shared surfaces) as an antidote to the spread of colds and flus. Did it work? We have two awards that say so, and we still see Yukoners sneezing into their elbows. Aasman was also a finalist in the logo category for an identity design for the Old Log Church Museum. The Design Edge contest received nearly 500 entries from across Canada, and a total of 142 finalists were chosen. Of these finalists, 58 winners were chosen. View the gallery of finalists and winners. As a fan of clever marketing (especially in the Yukon) and a number one fan of this campaign, congratulations on winning the award…very well deserved! !